Although the coastline of California had been explored by sea for over 100 years by Spaniard captains such as Cabrillo and Vizcaino, it wasn’t explored by land until 1769. 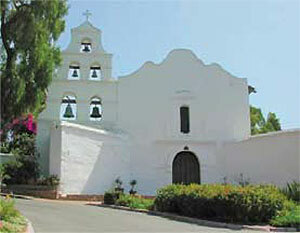 Led by Father Junipero Serra and Commander Don Gaspar de Portolá, a small group of men traveled north from Baja (lower) California and founded Mission San Diego, the first of 21 missions. Funded by Spain, the missions flourished until the Mexican Revolution. Beginning in 1833, the missions were secularized. In 1776 Don Juan de Anza led the first group of immigrant families from Mexico into Alta (Upper) California. The settlers lived in small pueblos and shared common lands for crops and cattle. The Franciscan padres held ownership of all the land in trust. After the Mexican Revolution, the missions were secularized and the land was divided into large ranchos. By 1840 the power, the wealth and the handling of all commerce in California had shifted from the missions to the ranchos. The photo above is of the Jose Carmen Del Lugo family. A typical rancho family, they owned the 37,700-acre Rancho San Bernardino, which covered the whole valley. They sold it to members of The Church of Jesus Christ of Latter-day Saints on October 1, 1851. Their rancho later became, and remains, the largest county in the United States. Adventurous men, such as Jedediah Smith, Kit Carson and John C. Fremont trekked over the Sierra Nevadas and discovered a beautiful, bounteous land. Fremont’s published accounts lured many pioneers west. Some Yankees and Europeans came by sea and had a thriving hide and tallow trade with the missions and later the ranchos. Some, such as Robert Livermore, became Mexican citizens and married native senoritas. John A. Sutter became a citizen in 1840 and began building an empire. On July 31, 1846 the ship Brooklyn sailed slowly into the San Francisco Bay. On board were pioneer families from the east, the first organized group ever to immigrate to California by sea. They were surprised to learn that Yerba Buena was no longer under Mexican rule. They were members of The Church of Jesus Christ of Latter-day Saints (also called “Mormons” or “Saints”). With a ship full of supplies and blessed with a wide variety of skills, talents and knowledge, they began building homes, planting crops and establishing commerce. Within one year these pioneers turned the village of Yerba Buena into a bustling city and renamed it San Francisco. Their leader, Samuel Brannan, sent a group inland to establish a community called New Hope. They grew some of the first wheat in the San Joaquin Valley. Because of pioneer immigration, California’s economy changed from rancho to farming. Resourceful pioneer farmers set the stage for national and international recognition of agricultural excellence and cutting edge technology. One of the earliest Mormon pioneer of record to arrive in California was William B. Ide. After the martyrdom of the Prophet Joseph Smith, Ide headed for the Oregon Territory with his wife, Susan, and five children. An old fur trapper at Fort Hall convinced him to head for California instead. They arrived at New Helvetia (Sutter’s Fort) on October 25th, 1845 and settled near Red Bluff. The next spring Ide received word that the Mexicans were going to run the “Americanos” out of the area. He was one of a group of thirty men who rode to Sonoma and captured General Mariano Guadalupe Vallejo and his Garrison of men. On June 14, the group established the Republic of California and created a flag. These frontiersmen chose the grizzly bear, representing strength and unyielding resistance, as the emblem for their flag. California’s flag still retains that symbol. Ide served as president until July 9,1846, when they turned the republic over to Captain John C. Fremont as an official of the United States of America. Much has been written about the ill-fated Donner Party, who took a short cut to California. Thomas F. Rhodes and his 38-member Mormon party had remained with the larger wagon train and arrived at Sutter’s Fort on October 5, 1846. In February 1847, Rhoads’ sons, John and Daniel led a party of seven men who rescued the survivors of the Donner Party. Lavina Murphy, a Mormon, and her children survived. Marysville was named after her daughter, Mary. In April 1847, General Stephen W. Kearny and his handpicked party of fifteen members of the Mormon Battalion escorted John C. Fremont back to Ft. Leavenworth for a court martial. When they came upon the remains of the Donner Party, they stopped long enough to bury them. Rhoads and his family settled near Sutter’s Fort. He purportedly had seventeen gold mines when his friend, Brigham Young, asked him to move to the Valley of the Great Salt Lake. In August 1849 his “Gold Wagon Train” carried, in current values, $500,000 to Utah. This gold was used to set up the Salt Lake City Mint, which minted some of the first gold coins in the West. In June 1846 Brigagier General Stephen Kearny readied his 300 troops at Fort Leavenworth, Kansas. 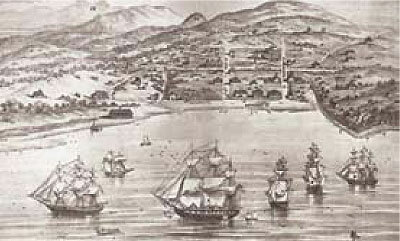 When war was declared with Mexico, Kearny headed for California on June 28. Meanwhile in Iowa, Captain Allen recruited 500 Mormon Volunteers. Quickly organized and with a minimum of training, the “Mormon Battalion” left on July 20, 1846. After Captain Allen became ill and died, Lt. Colonel Philip St. George Cooke assumed command. Suffering from heat, thirst and hunger they forged a 700-mile-long wagon road from Santa Fe to the coast, arriving on January 29, 1847. As Brigham Young had promised them, they never fought a battle. Andrew Pico and John C. Fremont signed the Treaty of Cahuenga ending the war in California on January 13, 1847, sixteen days before the Mormon Battalion reached San Diego. After mustering out of the U.S. Army in the summer of 1847, many ex-Mormon Battalion men left Los Angeles and headed north. About 100 men hired on for the winter with John Sutter. Six were present when James Marshall discovered gold in Sutter’s millrace in January 1848. Shortly thereafter, two Mormon workers made the second find at “Mormon Island,” which became one of the richest digs of the gold rush. Interestingly, after they finished their contracts with Sutter, most ex-Battalion men turned their backs on the lucrative gold fields and sought something more precious to them, their families. They headed east to find their loved ones, many of whom were stranded on the plains of Iowa. Samuel Brannan Published a special edition of his California Star newspaper and sent it east with news of the discovery of gold. A consummate business entrepreneur and real estate investor, he was one of the richest men in California in the 1850s and 1860s. Rumors of gold in California were confirmed by President James K. Polk in his State of the Union address in December 1848 and the rest is history. California’s population exploded. Land titles were clouded and chaos reigned. Squatters plagued John Sutter and many “Californio” ranchers. Pioneers often had to “buy” their land several times over. Some California Mormon pioneers became wealthy selling goods and produce to miners. Others headed east to join Brigham Young in the Valley of the Great Salt Lake and helped settle many communities throughout the West. In the midst of all the pandemonium, the military struggled to maintain law and order using Mexican laws. They urged the immediate transition to statehood. In Washington D.C., slavery and othe rissues delayed a decision. Senator Henry Clay finally worked out a compromise. With President Millard Fillmore’s support, California became the 31st state on September 9, 1850. Seeking to create a Mormon corridor from Salt Lake City through Las Vegas to the San Pedro Harbor, Brigham Young authorized Charles C. Rich and Amasa Lyman to establish a settlement in Southern California. In 1851 some 437 colonists left Utah with high hopes and plans to build a new community. Captain Jefferson Hunt was highly respected by members of the Mormon Battalion, who chose him to be their leader. After mustering out of the U.S. Army, he spent a year in the gold fields. He played an important role in the history of Southern California and served in the California Legislature. Until the coming of the railroad San Bernardino was the center of commerce in Southern California.